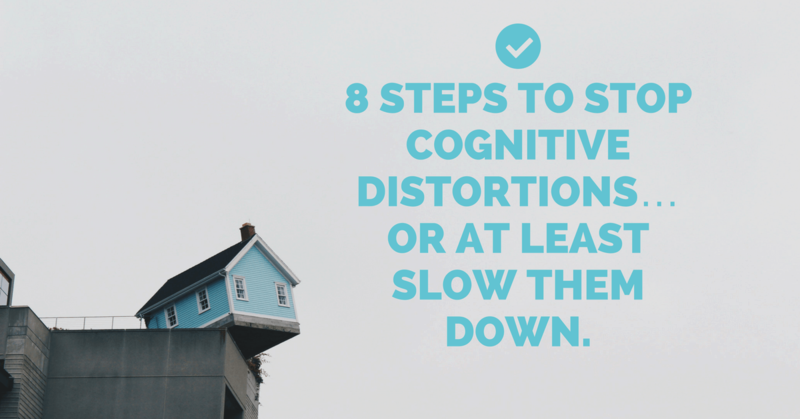 8 Steps to Stop Cognitive Distortions… or at least slow them down. 2. Write it down. Yes, take your cognitive distortions to pen to paper. It makes a difference. 3. Then take your distress temperature. Zero to ten. Zero meaning your content and peaceful; ten that your misery is paralyzing. 4. Ask yourself: Is it reasonable to think that thought or is it unreasonable? Say the thought out loud. If a friend said that, would you agree or disagree? If the thought is truly reasonable it probably isn’t a distortion. If the thought is truly reasonable it probably isn’t a distortion. You just need to take responsibility for whatever it is that caused the thought and the resulting bad feeling and do something about it. Either decide to take action, or let it go, or both. For example, when I said something mean to my sister and she reacted by getting mad, I felt horrible. Was it reasonable that she be mad? Well, yes it was. Was it reasonable for me to think I was a horrible person? No, that was unreasonable. But it was reasonable for me to feel remorse. It was up to me to take responsibility for hurting my sister, apologize, promise never to do it again, ask forgiveness and let it go. 5. What kind of cognitive distortion is it? All or nothing thinking? Fortune telling? Figure it out because chances are you have a pattern going on. Once you have the distortion labeled you will be in tune to when it happens again in a different context. 6. Write down a more reasonable thought to replace the distorted one. If you can’t come up with anything, think about what your friend would say. Or what would the angel say to the cognitive distorting devil? 7. Retake your distress temperature. Even if it’s just a few degrees lower, from a 9 to a 7, say, you are going in the right direction, and that’s a good thing. Do not expect to ever be completely free from Cognitive Distortions. That would be unreasonable (Ha Ha :-). However, the more you do this exercise the easier rescuing your mood and lowering your distress temp, gets. Until one day, in a snap, you recover your cognitive balance as easily and gracefully as an Olympic gymnast! What are Cognitive Distortions? How do They Fuel Anxiety & Depression? This is super! I had one of those “cognitive distortions” yesterday – all day 🙂 Or several spread out over the day? Very helpful info. Thanks! Amazing…I’ve been haunted by these thoughts almost my whole life, never knowing why I thought this way. I manifested Machiavellian plots of betrayal based on no facts whatsoever. I appreciate the example or the call from the boss. Thank you!